More so than for their elders, the internet is a central and indispensable element in the lives of American teens and young adults. 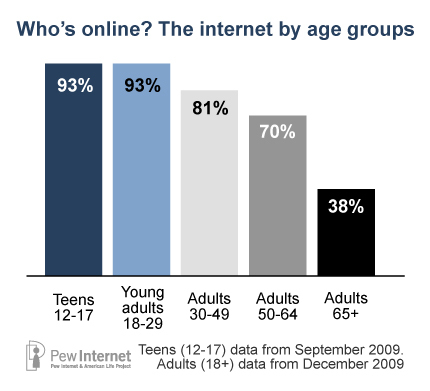 The youngest adults, 18-29 year-olds, go online at a rate equal to that of teens (both 93%). Over the past decade, young adult have remained the age group that is most likely to go online even as the internet population has grown, and even as other age cohorts – such as adults 65 and older — have increased the percentage of their populations online. Among adolescents, both boys and girls are equally likely to go online, but younger teens remain slightly less likely to go online than older teens. Fully 95% of teens ages 14-17 go online compared with 88% of teens ages 12-13. Most of the variance among younger teens is accounted for by 12 year olds, of whom 83% go online compared to 92% of 13 year olds. 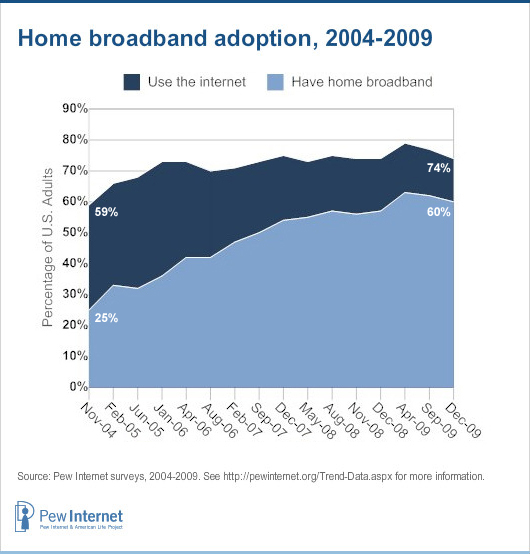 For families with teens, home broadband adoption grows. Among families with children between 12 and 17, more than three-quarters (76%) now have broadband internet access at home, up from 71% in February 2008 and significantly larger than in 2004, when just half of all households with teens had some type of broadband access. In 2009, about a third of all internet using families have a cable modem (32%), another third (30%) have a DSL enabled phone line, and another 11% report a wireless internet connection. Three percent of families have a fiber optic connection. Just 10% of families have a dial-up internet connection, down from 16% in 2008 and 49% in November 2004. Another 8% of families do not have a computer at home, and 4% have a computer, but the machine is not connected to the internet. Moving beyond just families to look at the American adult population at large, 60% of adults go online from home using broadband.4 More than three quarters of young adults ages 18-29 have broadband at home, as do 67% of 30-49 year olds, a little more than half (56%) of 50-64 year olds and just a quarter (26%) of those 65 and older. Nearly 2 in 5 households (37%) with broadband have a cable modem, 28% have a DSL connection and 17% have a wireless connection to the internet. Another 6% have fiber optic, T-1 or some other type of fast connection. Nearly two-thirds of teen internet users (63%) go online every day – 36% of teens go online several times a day and 27% go online about once a day. 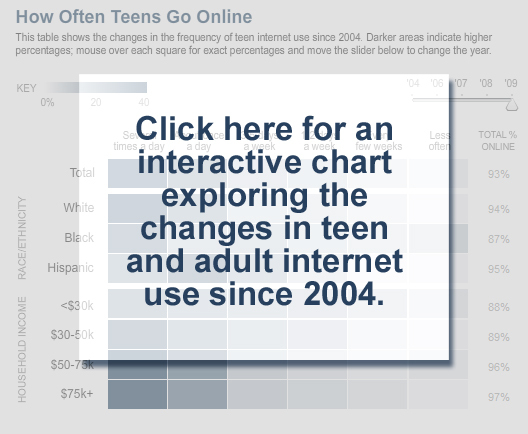 More than one quarter (26%) of teens go online weekly and 11% go online less often than that, patterns that have been in place since November 2006. There are few differences in frequency of use based on demographic categories. Older teens ages 14-17 are more likely to go online frequently than younger teens. Nearly four in ten (39%) older teens say they go online several times a day, while a little more than a quarter (28%) of younger teens go online as frequently. White teens are also slightly more likely to go online frequently – several times a day – compared with Hispanic teens, who are more likely to report going online once a day or 3 to 5 days a week. Broadband and wireless internet users go online much more frequently than dial up and stationary internet users. 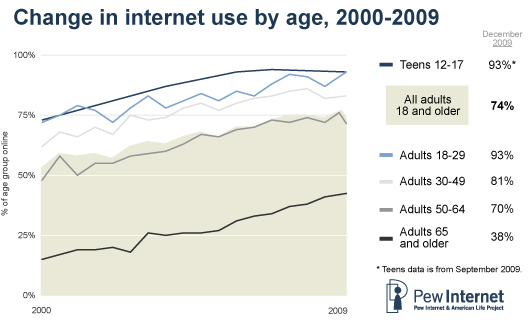 The frequency of teen internet use is comparable to the frequency of internet use among online adults 18 and older. Among adult internet users, 68% go online daily, 21% go online several times a week, and 10% go online less often than that. These figures from September 2009 are comparable to adult findings from December of 2006, when 67% of adult internet users were online daily, 21% were online several times a week, and 6% were online less often than that. Young adult internet users – those under age 30 – do not go online any more frequently than internet users age 30 and older. However, adult internet users with home broadband connections and adults who access the internet wirelessly go online much more frequently regardless of age than other internet users. About three-quarters of adult home broadband users (76%) and wireless internet users (76%) go online every day, compared with just 42% of adult internet users without home broadband connections and 52% of wired internet users who go online daily. 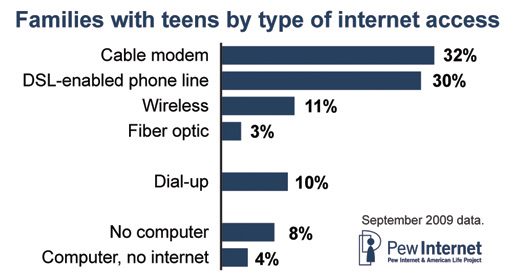 Teens who live in households with broadband are also more likely to go online frequently than teens with dial up internet access at home – 40% of broadband-using teens go online several times a day compared to just 21% of those with dialup access. White online adults are more likely than Hispanic online adults to be daily internet users, and the frequency of an adult’s internet use is positively correlated with both educational attainment and household income.